solution to enhance its supply chain visibility. Logistics management is an inherently complex process, involving the management of moving and positioning inventory throughout a supply chain. Currently there are many significant logistics trends affecting Australian business with the aim of managing this complex process. Some examples are Lean thinking, RFID technology, use of 4PLs, global supply chains, and free trade agreements, to name just a few. However, there is a trend that I believe underpins and enables the examples just described and affects Australian business in the way they conduct business now and in the future. This trend is towards the use of e-logistics to enable collaboration. E-logistics solutions for organisations are increasingly being developed and implemented with the aim of improving the complex process of logistics management through increased information flow and collaboration in a supply chain. What is e-logistics and collaboration? The use of ‘e’ was first seen in the 1990s through home shopping via the internet, with ‘e’ business marketed as the way of the future. Unfortunately, it did not receive the anticipated response that was hoped, due to slow communication equipment available at the time, and a lack of consumer understanding. Jump forward to 2006, and ‘e’ has continued to develop with many companies now offering ‘e’ business options and solutions to customers and suppliers, through banking services to the purchase of retail goods. Just look at how popular eBay has become. However, the term e-logistics is a comparatively recent development and a logical progression of ‘e’. A widely accepted definition of e-logistics has not yet been developed, though in its simplest form, e-logistics is simply the processes necessary to transfer goods sold over the internet to customers. Alternatively, in a more complex form e-logistics is a wide-ranging topic, related to supply chain integration using the internet as the communications medium. This article will focus on e-logistics in the broadest sense of integrating the elements of a supply chain through the electronic transfer of information to enable collaboration. Collaboration is currently a theme that organisations are looking to implement in their logistics processes, with e-logistics seen as a tool to provide improved collaboration and information flow in a supply chain. Collaboration can be defined as the ability to share information regarding business activities and interact on a close to real-time basis in the supply chain. It provides greater visibility of the supply chain, which then provides a greater ability to measure supply chain effectiveness by all organisations involved. Collaboration by an organisation can be internal and external. Many Australian organisations have implemented internal collaboration solutions to improve their business and information flow through the use of enterprise resource planning (ERP) software that align an organisation’s internal business process, such as forecasting, sales, and inventory management. However, older and some current versions of ERP software do not integrate external supply processes with an organisation’s suppliers or retailers. This is an opportunity that organisations need to look at addressing. A number of e-solutions to enable external collaboration have been designed over the past decade, such as efficient consumer response and vendor-managed inventory, however, these systems were single-minded in their approach as opposed to viewing the whole of the supply chain to enable collaboration. Electronic data interchange (EDI) was seen as the e-solution to enable external collaboration by connecting companies with their suppliers and retailers and sharing information. However, each supplier required EDI to communicate effectively, and the implementation of EDI was considered costly for small companies. A number of new e-solution initiatives to enable external collaboration have been designed such as collaborative planning, forecasting and replenishment (CPFR) software, with overseas organisations such as Gamble and Proctor and Wal-Mart implementing it. There is also middleware collaboration software available, with Siemens adopting a web-based collaboration system to share business data with its customers and suppliers, while still being able to use its existing ERP system. The installed system is comparatively cheap and expected to pay for itself in six months. CPFR, current ERP systems and web-based collaboration software are all e-logistic solutions, assisting organisations to enable collaboration with their trading partners and to enjoy the benefits available from collaboration. What are the benefits to Australian business? The benefit of integrating manufacturing, purchasing, warehousing, sales and logistics functions has long been recognised. Over the past 20 years, several approaches have been taken to improve relationships between the various players in a supply chain. These have included vendor-managed inventory, quick response, and just-in-time. The aim of all of these initiatives is to enable the sharing of data, to allow early identification of trouble spots and therefore allow managers to take prompt action to mitigate risk. While initial efforts involved vertically integrated operations ‘in-house’, later attempts focused on external partnerships, with each organisation managing its portion of the supply chain and monitoring its partners to ensure contractual obligations were fulfilled. More recently, and in order to optimise the entire supply chain network and not just create locally optimised arrangements for one or two partners, strategic partnerships with suppliers and customers have become more prevalent. The widespread acceptance and use of the internet and more flexible systems in electronic commerce has enabled these collaborative relationships to be widely adopted. Progressive Australian businesses are moving from the ‘need to know’ mentality to a more open attitude of relevant information-sharing with supply chain partners. It has been researched that collaborative supply chain management not only reduces waste in the supply chain, but also increases responsiveness, customer satisfaction and competitiveness among all members of the partnership. Thus collaborative supply chain management can transform a business and its partners into more competitive organisations and provide a competitive advantage in their chosen market. Specific advantages through utilising e-logistic solutions (CPFR, middleware software) for collaboration include integrating business practices amongst trading partners by using internet technology to reduce inventory and expenses, enhanced shipment data visibility, improved production planning, building stronger relationships with suppliers, increased level of forecasting accuracy, and linking demand with supply planning. However, it needs to be noted that trust and interdependency are key elements amongst collaborative partners who see collaboration as a strategic asset to achieve competitive advantage. Like any trend, there are issues for a business to be aware of in implementing an e-logistics collaboration system. Two primary issues are trust and interdependency. One of the fundamental paradigm shifts exhibited by leading firms in the transformation of their supply chain capabilities is the move from information hoarding to sharing. A key issue of this is that information sharing is heavily dependent on trust, beginning within the business and extending to supply chain partners. Information sharing may take many forms, including the exchange of data files and provision of direct access to databases. Trust needs to be fostered in a collaborative relationship for it to be successful. Attaining the required levels of trust between trading partners for collaboration to work is not easy. A lack of complete trust between trading partners can create an adversarial supply chain relationship. The possibility of sensitive data from one company being used to the other companies’ advantage creates mistrust. A lack of trust between partners will result in limited collaboration, which will affect each organisation’s supply chain effectiveness. However, to ensure trust is part of a collaborative relationship, a company should ensure that ground rules for that relationship are stated and formalised in written documents. This is achieved through non-disclosure agreements, partnership agreements and service level agreements. The active management of formalised agreements, joint planning and regular communication of all factors will ensure trust in a collaborative relationship. Further, organisations need to develop an e-business collaboration strategy with senior management support to enable collaboration to work. As organisations become more collaborative, they are also becoming more interdependent with their trading partners. This raises the issue of managing each of these relationships or interdependencies. Part of relationship management includes identifying what each partner will gain by entering into a relationship. This needs to be clearly articulated and agreed to by each partner for the relationship to be successful. However, as with any relationship, who has the power in a relationship can become a factor and the influence they exert on the relationship needs to be understood, particularly in a supply chain that has a series of relationships with differening levels of influence. An overseas example is that Wal-Mart has mandated that its suppliers will implement RFID if they are to supply to it. This example demonstrates the power one organisation can exert on a supply chain, with its trading partners needing to adopt its mandate or suffer lost trade. Consequently, an organisation needs to fully understand the relationship it is entering into and how the collaboration will benefit its organisation. Are there Australian businesses adopting this trend? Two Australian organisations, Australia Post and the Australian Defence Force (ADF) have seen the opportunities provided by this trend and have used e-logistics successfully to enable collaboration with their customers and suppliers. Australia Post has been developing new e-logistics systems and protocols to improve the interface between its domestic distribution businesses of Parcel Post and Express Post and its joint-venture distribution businesses Star Track Express and Australian air Express. Part of this new system includes increased security, which is a vital aspect of the postal industry with millions of personal and business letters and parcels moving throughout the supply chain on a daily basis. However, through collaboration with suppliers, other postal organisations and Government agencies, the use of internet technology is now being used to provide track and trace, enhance mandated security measures and improve customer service. The Australian Defence Force (ADF) has adopted an e-logistics solution to collaborate with supply chain partners in order to increase supply chain visibility for deployed operations, through the use of a Lotus Notes-based application. This application is used to order and monitor high priority equipment orders on an operation, and has been successfully used in the Middle East, Afghanistan and East Timor. It provides ‘real-time’ visibility of an order and where it currently is in the supply chain. This e-logistics application has enabled Defence to be in a collaborative relationship with Defence contractors, Defence suppliers, transport and distribution organizations and finally the customer, are all supporting a common aim of providing equipment to an operation in the most efficient way. During the implementation of the package it was noted that trust had a direct impact on the level of collaboration between Defence and its contractors. This was due to sensitive Defence information being shared. Consequently, Defence contractors were required to sign non-disclosure statements before being able to gain access to the application. Defence and Defence contractors were also aware that by increasing collaboration through an e-logistics application there would be increased risks. However, many of the risks were identified early such as access control to sensitive data and downtime of software, with risk mitigation strategies established and implemented before implementation. With ADF deployments increasing and more equipment resources required, the ADF has recognised that greater collaboration is required with all organisations involved in the supply chain, if it is to increase efficiency and customer satisfaction to ADF personnel on operations. 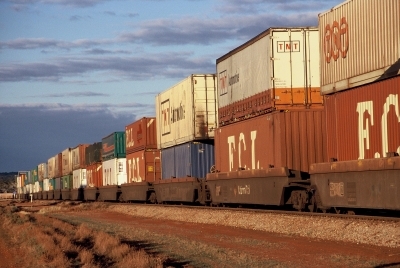 Although e-logistics is a relatively recent trend, its effectiveness for enabling collaboration with trading partners in a supply chain is an advantage and opportunity that Australian businesses need to consider how they can adopt into their business. As described, the advantages and opportunities of adopting e-logistics to enable collaboration will enhance a business’s logistic processes whilst increasing competitive advantage in their chosen market. This is a trend that will assist the contemporary Australian supply chain manager in dealing with the complex logistics environment. Squadron Leader George Hodgson is the Caribou Through Life Support Manager at the RAAF’s Air Lift System Program Office and a past winner of the Logistics Association of Australia’s Logistics Development Award. Excerpted from MHD Supply Chain Solutions, May/April 2008, pp.44-6.